This is our review of the popular Black + Decker GL9035 electric grass trimmer model. 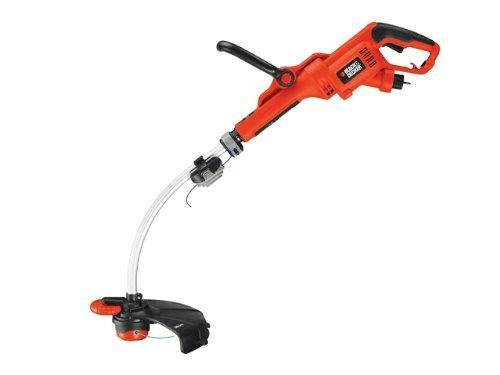 When we reviewed all of the corded grass trimmers, this one came out as the highest rated of them all. Now with an average price tag of around £75 is is getting towards the higher end of the price range. That said we have been able to find this product much cheaper at several online stores, so worth shopping around. Many buyers seem to think it is worth this investment to own a good quality trimmer. I won't argue with them as this is a top notch strimmer to use in the garden. This trimmer has a cutting width of 35 cm and also has a wheel edge guide which is very useful when it comes to tidying up the edges of your lawn. What most buyers liked though was the single feed line, that just made using the trimmer a great deal easier. If you are looking for a strimmer to tackle the wilderness, then this is the one for the job. Likewise if you want a strimmer that doesn't need replacing every year, this should also be your choice. Buyers agreed that this is a heavier then normal strimmer. It can get tiring after a while, but it is powerful, cuts through grass with ease and is durable. The heavier weight probably helps get the job done, so worth it in the long run. A few complained there was nowhere to store the lead. If you need to buy extra line for this Black & Decker model then Google the following part number Black and Decker part number (A6489) You should be able to find an online supplier close to you. This corded electric strimmer really does get great reviews, and has achieved a very high 88% customer satisfaction rating. It is strong, very powerful and has a good sized cutting swathe to help you get the job done faster. Some buyers did state that this is a heavy trimmer and that is true. The second handle which you can adjust is worth getting right as that really helps the balance of this trimmer. If you get that right then you will find this one much easier to use. Click Here to see our top rated list, if this is not the strimmer for you. This is a very good choice if you have a large area to clear. You should avoid this one if you are using this on a small well manicured area, as this trimmer is too aggressive for this. This is really a long grass and weed blaster that works quickly and effectively.